Can I transfer my music from PC formatted iPod to Mac? My iPod is formatted with the PC file system, can I transfer my music from the iPod to my new Mac? Yes, you can. The Mac can read Windows PC formatted disk drives and so will work with either PC or Mac formatted iPods. Therefore, TouchCopy for Mac will work with either Mac or PC based iPods when running on a Mac. TouchCopy allows you to copy data from your iPod, iPhone and iPad to your computer. You'll be able to access media such as Music, Photos, Messages, Contacts and more when you connect your device with TouchCopy. Then, simply choose the data that you want to copy to your computer, and hit Copy! Regarding your music, TouchCopy can copy your songs and playlists, along with all of the music's metadata. For this reason, you won't have to worry about loosing any information such as rating, year, genre and album art when copying music from iPod to Mac. You can use the free download of TouchCopy below to see what data from your iPod can be copied using the program, and even copy up to 100 music tracks free! Start TouchCopy from the Launchpad. Connect the iPod to the Mac using a USB cable. 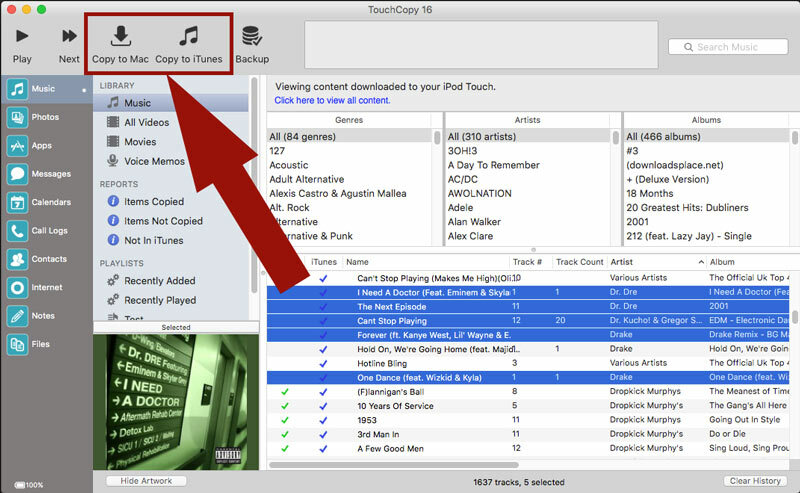 Select which music you would like to copy from your iPod, from the TouchCopy Music tab. Click "Copy to iTunes" or "Copy to Mac". "Copy to iTunes" will copy your music directly into your iTunes library on your Mac. "Copy to Mac" will ask you to choose a location to save your music to on your Mac. Check out our TouchCopy user guide for more information on how to copy music from your iPod, iPad or iPhone. My iPod/iPhone is formatted with the Mac file system, can I transfer my music from the iPod to the PC? How Can I View Files Copied to iPhone by TouchCopy? Will TouchCopy JailBreak my iPhone or iPod Touch, or perform any firmware modification? Is TouchCopy safe and legit?